Weather: Partly cloudy to sunshine. 27 degree Celsius. 8.0 knot wind from the southwest. Hint: See the pictures LARGER. If you click on any of the pictures in any of my blogs, they should open up full screen so you can see the detail better. Science Part I. Totally Awesome Turtle! 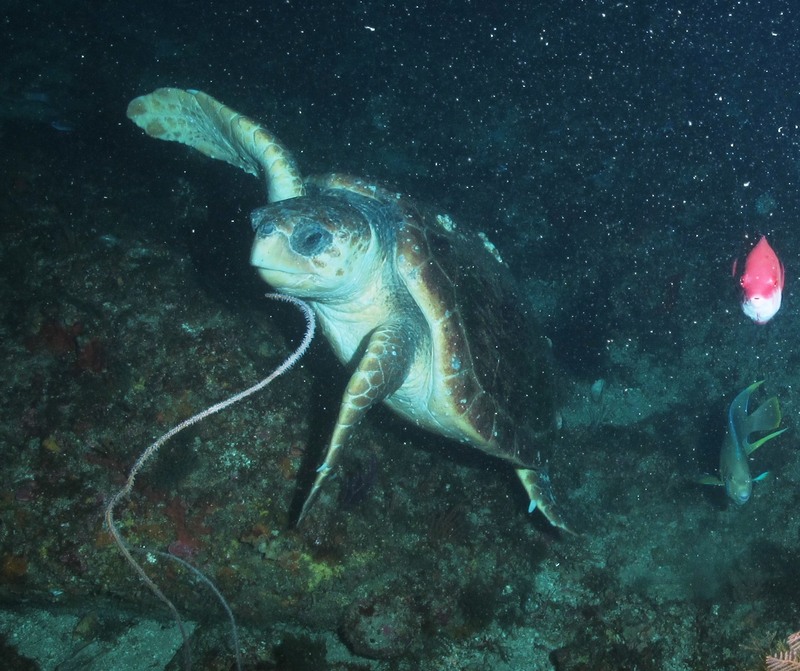 On Tuesday, June 24th during our first of four dives of the day a Loggerhead sea turtle came for a visit in front of the ROV. Loggerheads are common for the MidAtlantic and other oceans in the mid-latitude regions. Loggerheads grow up to 250lbs and are named for their relatively large heads. Loggerhead sea turtle. 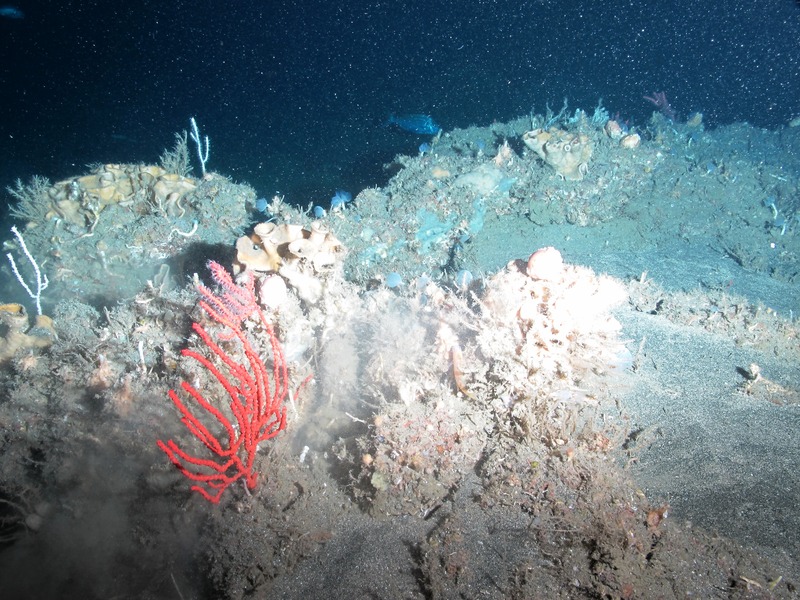 Photo credit to NOAA / UNCW ROV June 2014. This was a dream come true for me. I have always had this fascination with turtles stemming from catching them on Keller Lake in my early childhood to the snappers that have been visiting and nesting in our gardens the past few years at Goose Lake. Every turtle is entitled to a name, this one I am calling “TJ.” (Hi Taylor!) I hope we will see more. Scamp Grouper. 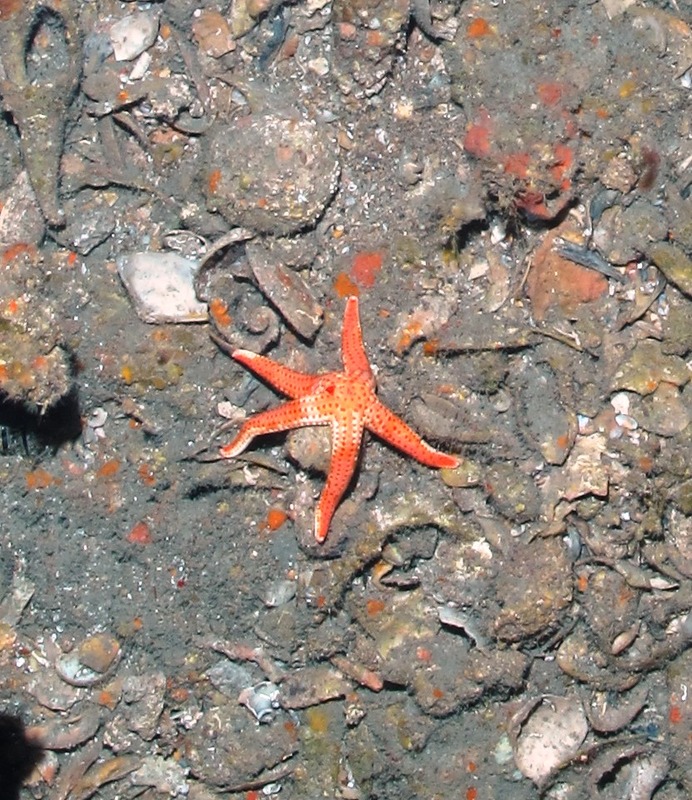 Photo by NOAA / UNCW ROV June 2014. 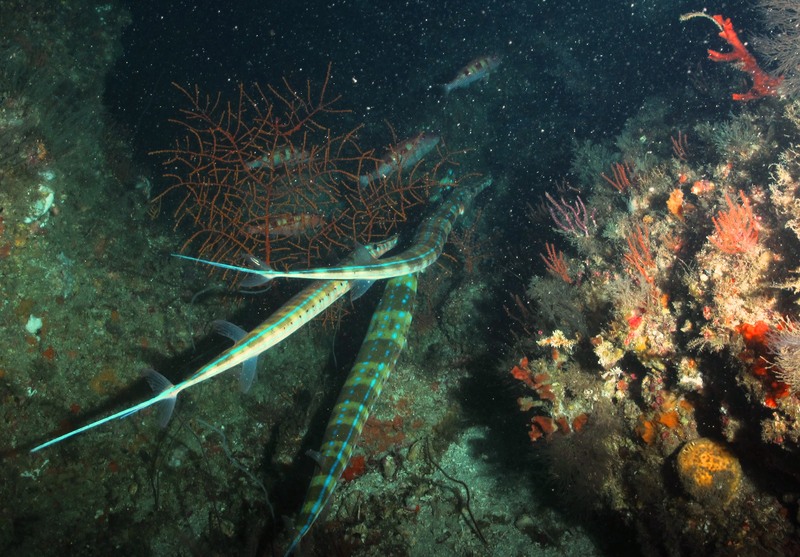 Cornetfish. Can grow to be 2-4 feet in length, 6 feet maximum. Although not possible to fully detect, when we photographed these it appears two males were courting a female. They almost danced together in the water. 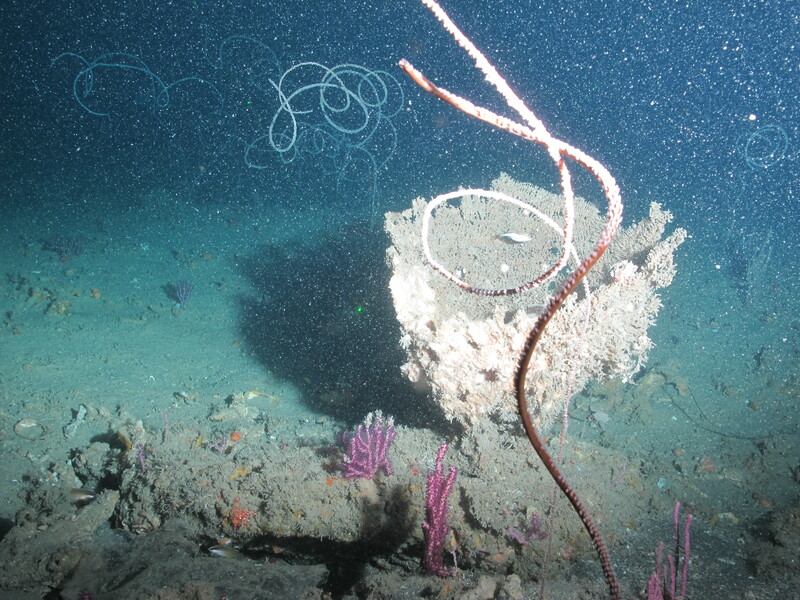 Photo by NOAA / UNCW ROV June 2014. 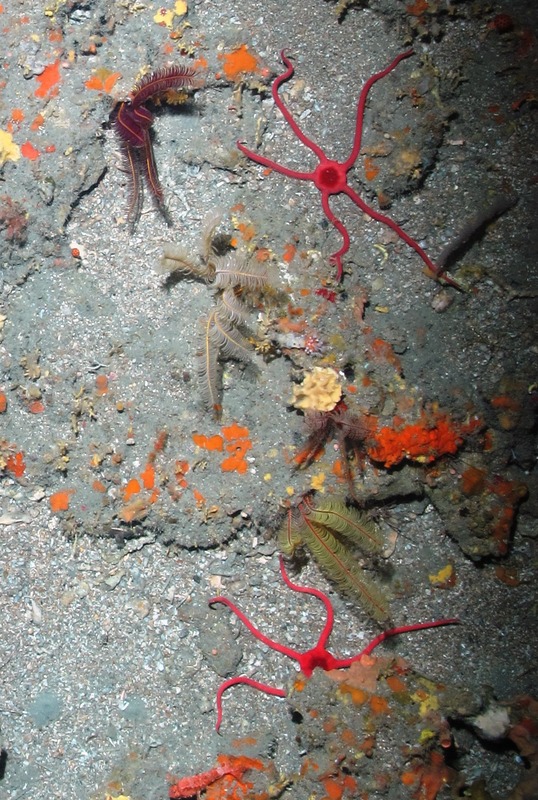 Here are a few we have found on the ocean floor the past few days with the ROV. By the way, it’s also a sky of stars at night from the ‘iron beach’ on the top deck aft of the bridge of the Nancy Foster. 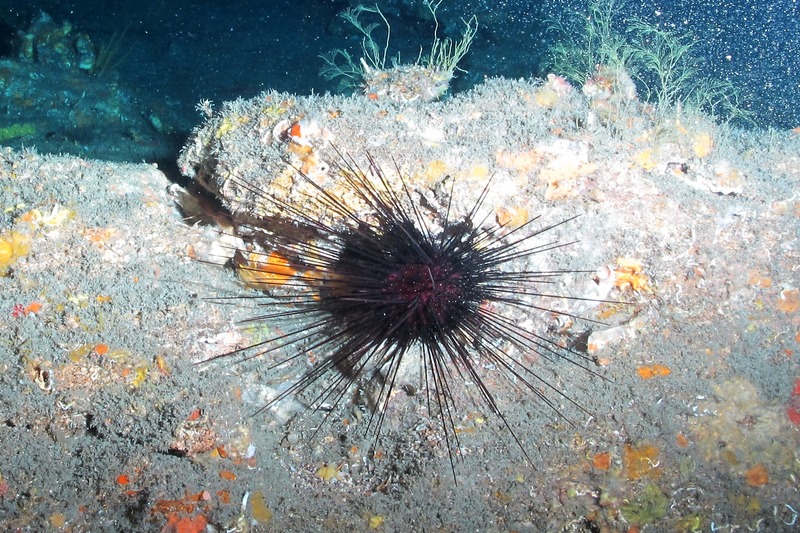 Asteroporpa Star wrapped around the backside of a diodogorgia photographed during ROV dive. Look hard past the purple and you can see it. Photo credit to NOAA / UNCW. June 2014. Longspine Urchin. 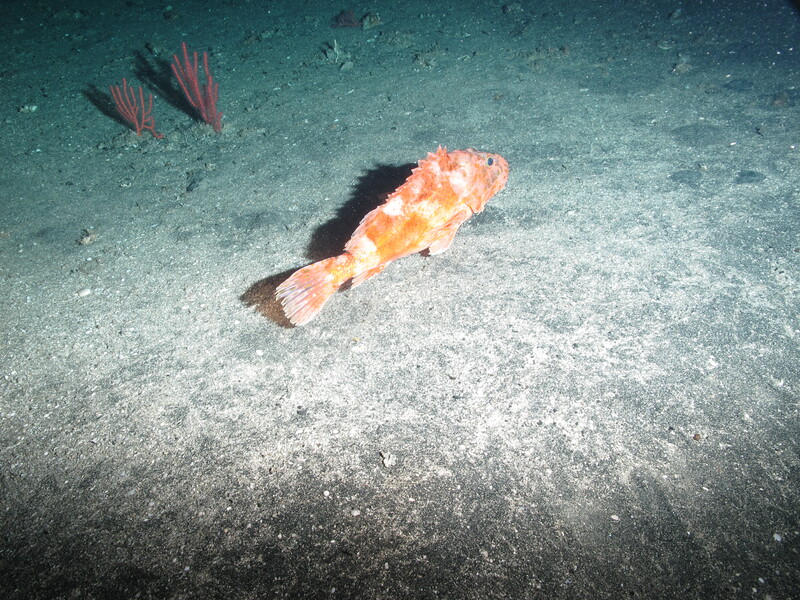 Photo by NOAA / UNCW ROV. June 2014. One of the mollusks we found. Thorny Oysters. There are three in this picture; the middle one is slightly open. 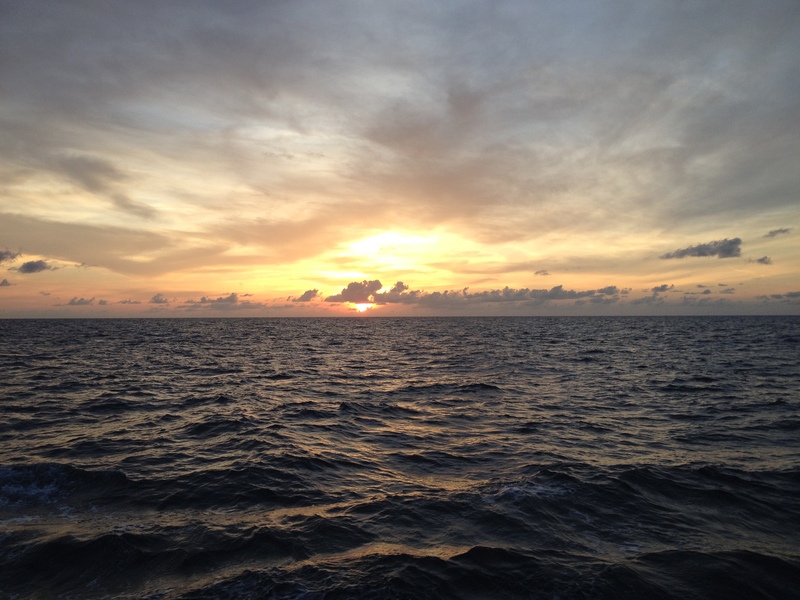 Photo by NOAA / UNCW ROV 2014. Science Part IV. Iceberg Scours dead ahead! 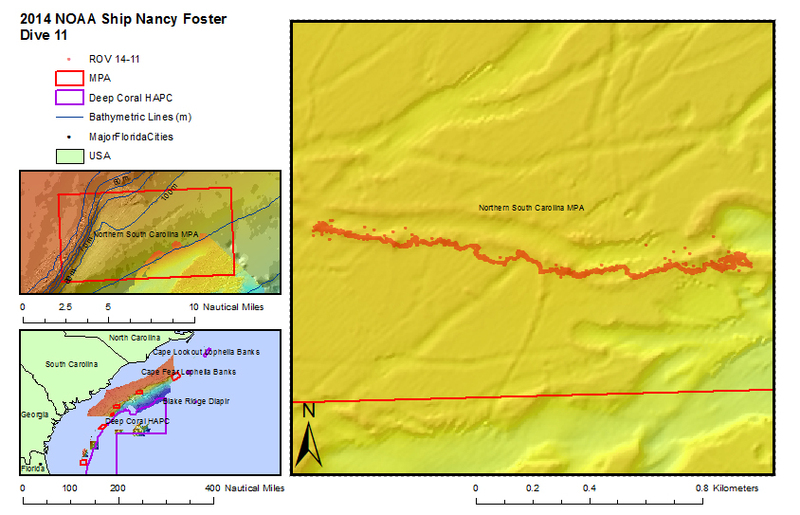 Many of the ridges and valleys Stacey Harter our chief scientist choose for us to investigate with the ROV are actually scours along the Atlantic Ocean seafloor created by icebergs that moved in a southwesternly direction towards the Carolina’s. Yes, I said icebergs! These scours I learned were probably created during the last deglaciation period, (~29,000-15,000 BP (before people)). I found this great blog post that summarizes some research on these and has a good graphic too. 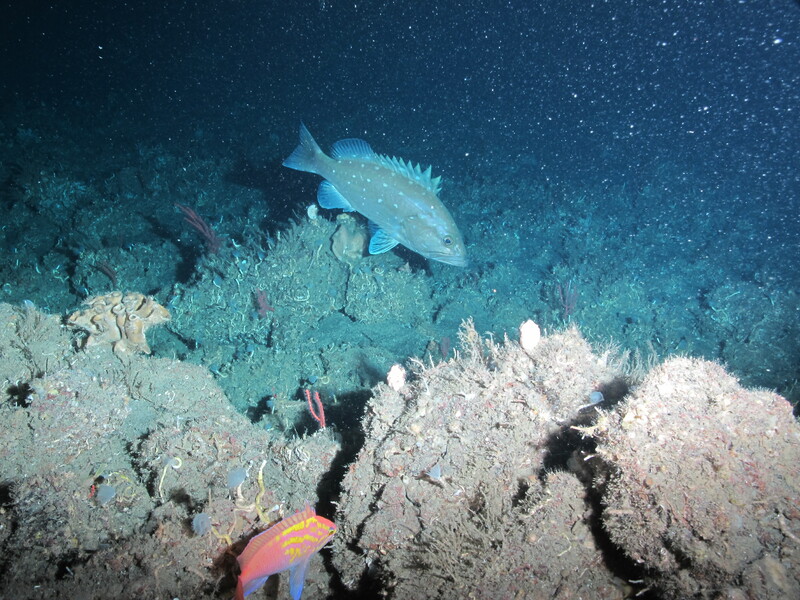 The scours are revealed through the multibeam mapping (MB) that the science mapping team conducts overnight. The image below is a MB map that shows the ridges and valleys (iceberg scours) and the red dots that form the line our ROV took exploring it on Sunday. Multibeam (MB) Map showing iceberg scours. The red dotted line near the middle of the image is our ROV track from the dive, going east to west. 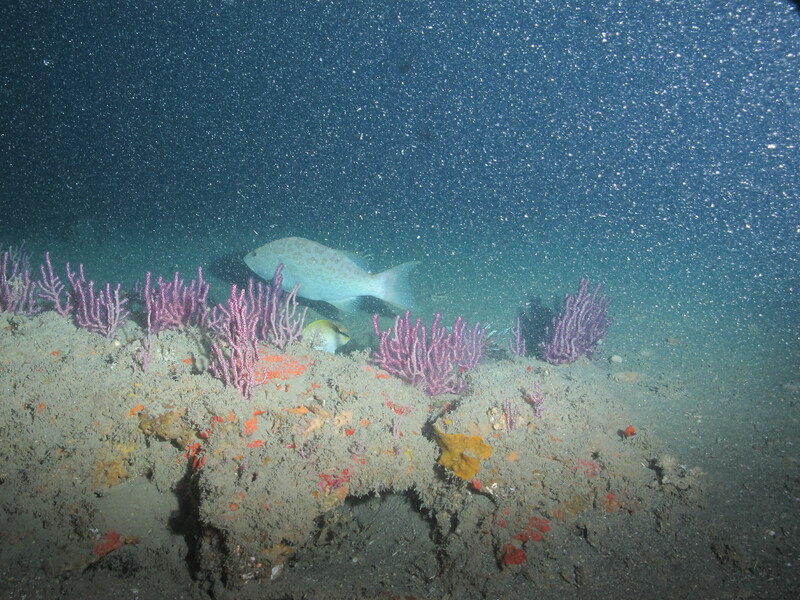 Image courtesy of NOAA and Harbor Branch Oceanographic Institute . June 2014. The earth science education I teach with the Earth Balloon and Earth Walk programs cover processes that shape and form the planet and I can’t wait to incorporate iceberg scours and the habitat they now provide into these programs! A call out to Jennifer Petro and her class at Everitt Middle School in Panama City, Florida. Jennifer participated as a TAS in 2013 on this same research project. Her class sent a collection of decorated styrofoam cups with Andy David from the Panama City NOAA lab for us to bring to the bottom during one of our dives. This is what happens when Styrofoam is subject to increasing pressure. Science Part V. I think we placed it here…I think it is here…It is here! 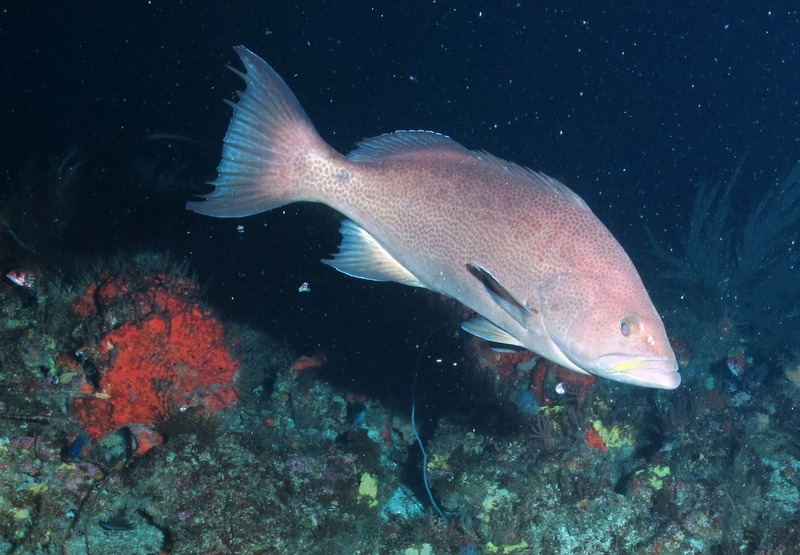 Earlier this spring, the South Carolina Department of Natural Resources in cooperation with the Army Corp of Engineers sank two barges to create artificial reef systems and habitat for groupers, tilefish, and countless other species. 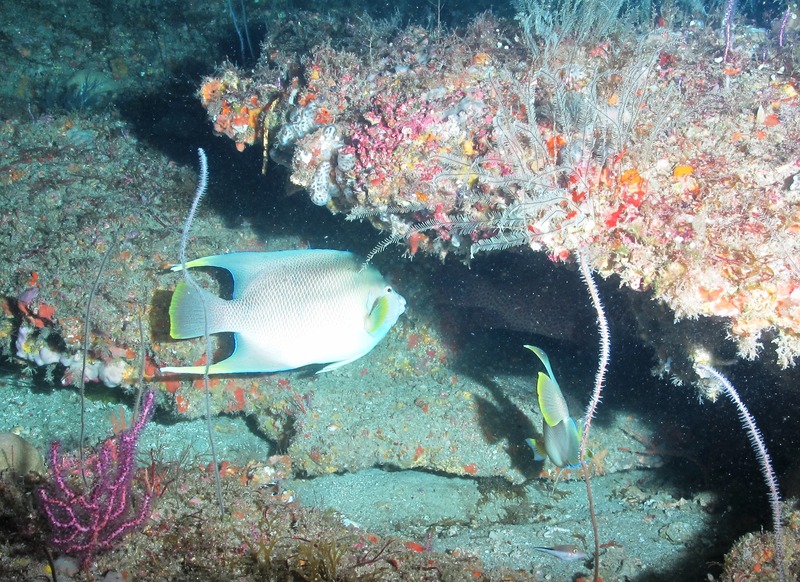 Artificial reef barge sank spring 2014 by the South Carolina Department of Natural Resources with cooperation from the Corps of Engineers. Its difficult to say for sure, but to give you a sense of scale, typical shipping containers like the green on one on top are are 40-50 feet in length. During the overnight hours of June 24th & 25th the mapping science team (see below) set out to find these two barges somewhere within a 2 square mile box using the MB aboard the Nancy Foster; that’s a lot of ocean to cover! I stayed up late with them and at about 10:00pm images began to emerge that resembled the barges. By 10:30pm, the mapping team had combed through the data and generated 3D maps that were strong evidence they had found them. 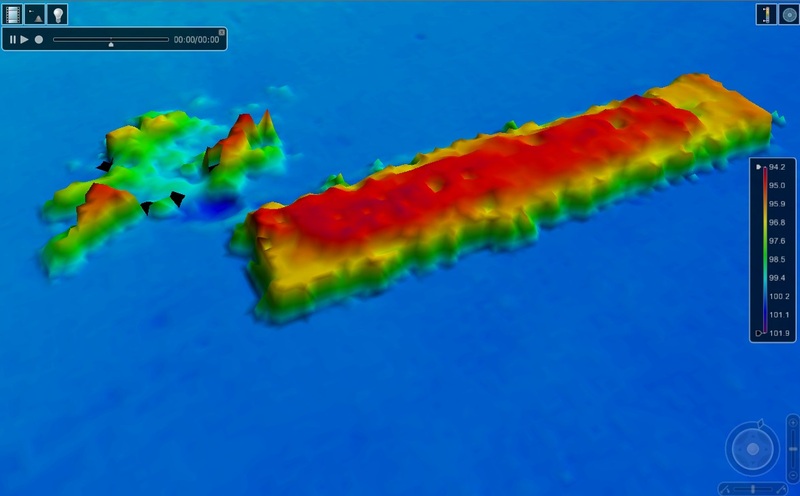 3D multibeam image of one of the sunken barges near the Edisto MPA. 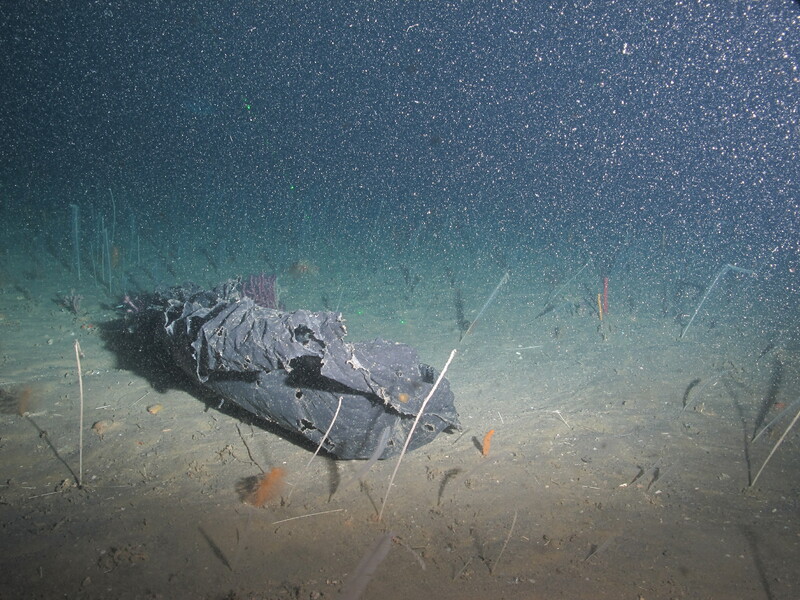 The barge is the rectangle, however there appears to be a mass of objects off one of its corners – keep reading. However, a hypothesis emerged; one of the barges may have flipped upside-down during its initial sinking and that some of the cargo containers had actually fallen off and came to rest on the ocean floor separate from the barge. During this discussion with the mapping team, I had this huge smile and was in awe with what they could do with sound waves! 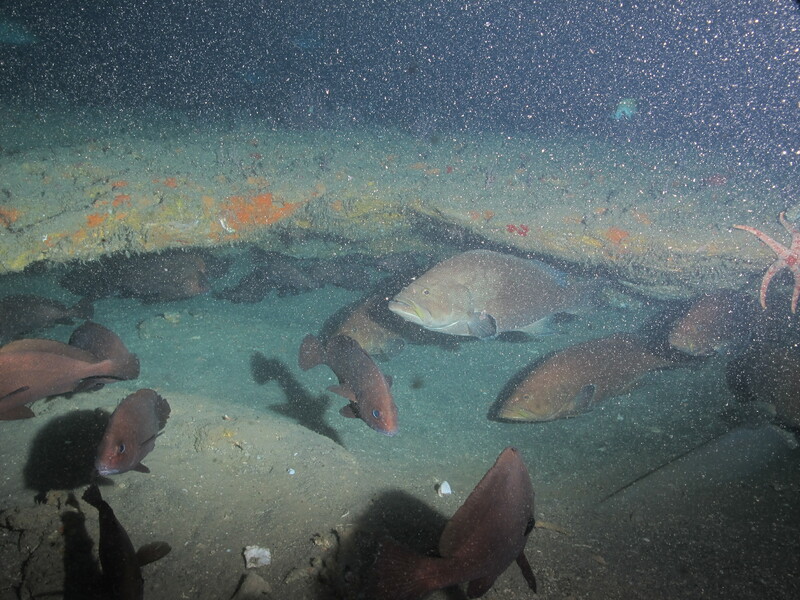 So on Wednesday afternoon, June 25th the ROV team went to work to explore the sunken barges. 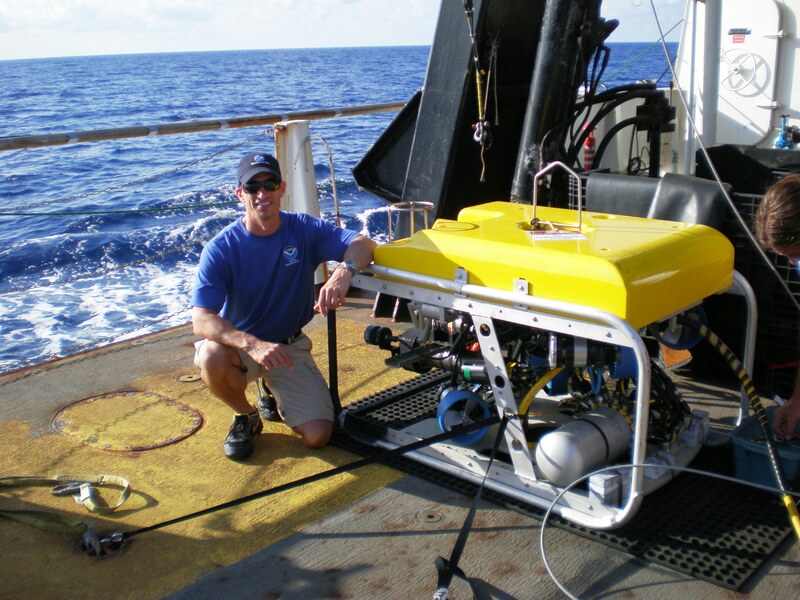 I watched as Lance Horn slowly guided the ROV down below 100 meters. Eventually we could make out the barge. Lance had to use his many years of ROV piloting to carefully maneuver. We could not let the umbilical fiber optic and power cord get caught on any of the metal debris and towers that projected outward. What did we discover? Unfortunately I am unable to show you the pictures. 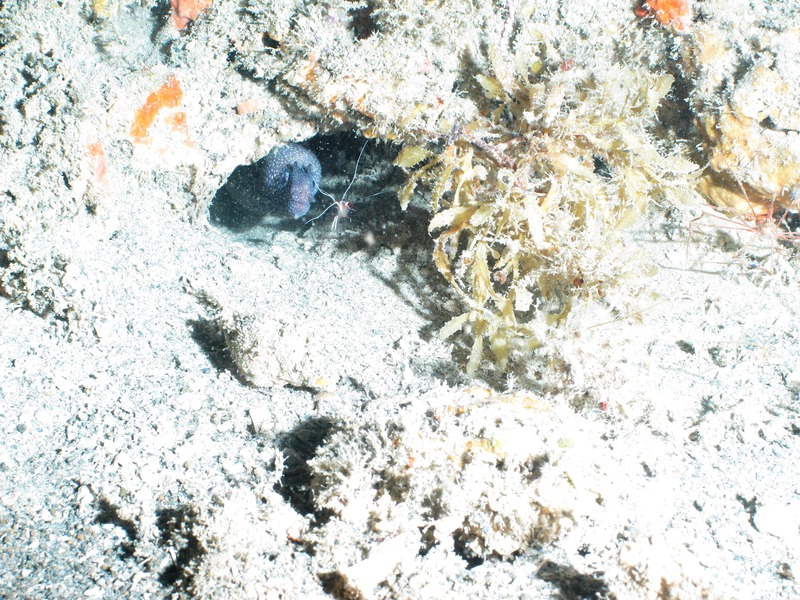 At 90 meters in depth it was so dark, the digital camera could not capture quality images – even with two LED lights. However, the HD video gave us clear visual and conclusions. The barge settled upright on the sea floor (it wasn’t upside down). However, we speculate that it came down with such force that the shipping containers and structures collapsed and broke away. Indeed four of them are lying on the ocean floor off the northwest corner of the barge. It’s only been a few months so habitat and few fish have yet to call it home, but schools of Amberjack were all around. 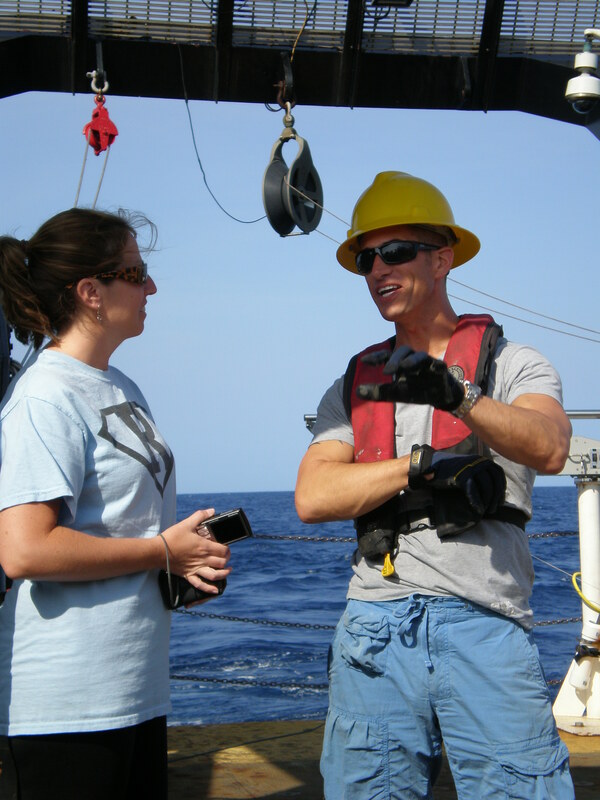 Kayla Johnson and Freidrich Knuth are our mapping scientists we brought on board as part of the science team and Samantha Martin and Nick Mitchell are fulltime NOAA mapping scientists assigned to the Nancy Foster. All four of them have very interesting stories about how they use their education and expertise to be eyes through the water column deep into the ocean. Freidrich and Kayla accompanied the science team as graduates from the Department of Geology and Environmental Geosciences at Charleston College. Mapping science crew aboard the Nancy Foster. From left to right: Freidrich Knuth, Nick Mitchell,Kayla Johnson. Not pictured – Samantha Martin. It is really inspiring to hear about their experiences in MB mapping in many of the oceans worldwide. 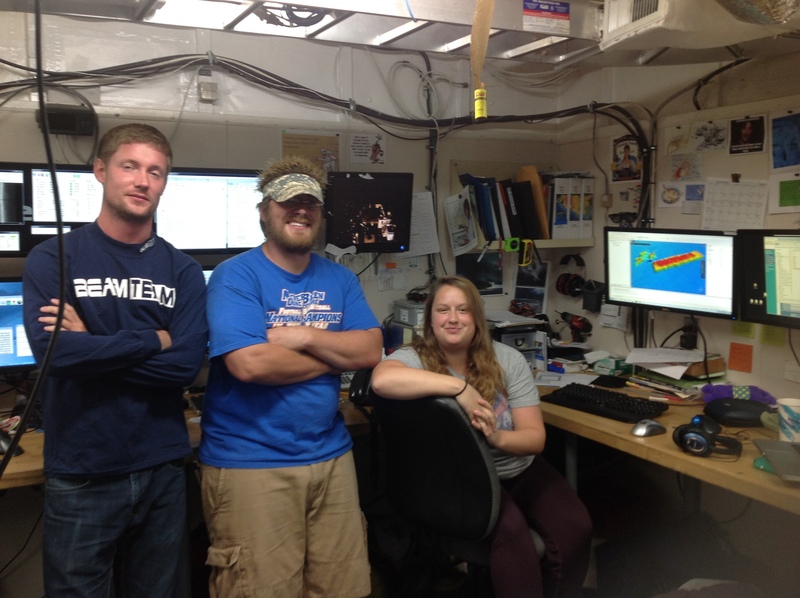 They are experts of combing through data we receive through a number of ship-mounted devices, applying complex GIS software (geographic information systems), and creating 2D & 3D maps that the science team can use to direct the ROV to the next day – which means this team works through the overnight hours and sleeps during the day. I have been running on the treadmill which is located in a small fitness center low in the ship. It’s a very awkward feeling when there are large waves and the treadmill and I are going up and down and swaying side to side. The way I look at it I am running on water so it has to be easier on my knees. I have lost track of the number of birthdays we have celebrated while offshore. From somewhere, seemingly daily, birthday cards and cakes emerge. And for another quote from The Big Thirst by Charles Fishman that I am reading while aboard the Nancy Foster. We are sailing for the Florida MPA overnight tonight (10-12 hours) and will be ready to launch the ROV again tomorrow. Saturday: Sunny, some clouds, 27 degrees Celsius. 6.0 knot wind from the southwest. 1-2m seas. Sunday: Cloudy with morning rain clearing to mostly sunny in the afternoon. 27 degrees Celsius. 13 knot wind from the west. 2-4m seas. Until today, most everything including the weather and sea conditions were in our favor. On the surface it just looks like waves (ok well big waves) but underneath is a superhighway. On Sunday morning the currents throughout the water column were very strong. The result was the ROV and its power and fiber optic umbilical cord never reached a true vertical axis. 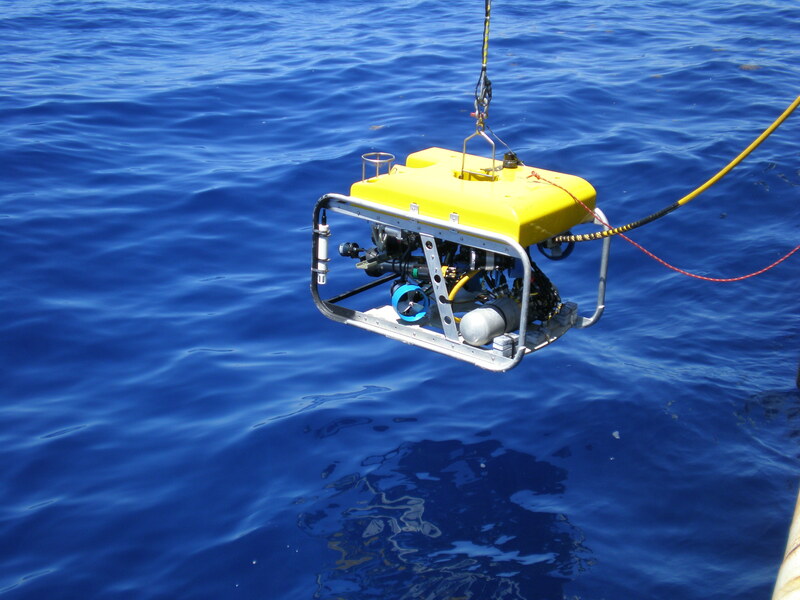 Even with a 300lbs down-weight and five thrusters the ROV could not get to our desired depth of about 60m. The current grabbed its hold onto the thin cable and stretched it diagonally far under the ship – a dangerous situation with the propellers. The skill of ROV pilots Lance and Jason and the crew on the bridge navigated the challenging situation and we eventually retrieved the ROV back to the deck. I presume if I were back home on Goose Lake in Minnesota, I certainly would have ended up with the anchor rope wrapped around the props in a similar situation. So, where is the current coming from and how do we measure it aboard the Nancy Foster? The Gulf Stream. Note the direction of the current and consider that on Sunday morning we were due east of North Carolina. 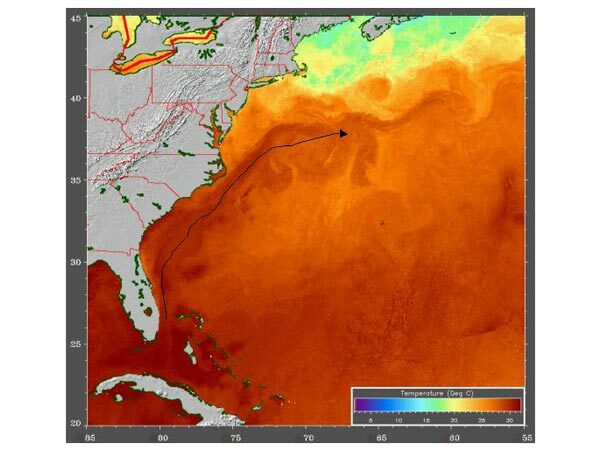 Answer: The Gulf Stream is an intense, warm ocean current in the western North Atlantic Ocean and it moves up the coast from Florida to North Carolina where it then heads east. You don’t have to be directly in the Gulf Stream to be affected by its force; eddies spin off of it and at times, water will return in the opposite direction on either side of it. Visit NOAA Education for more on ocean currents. 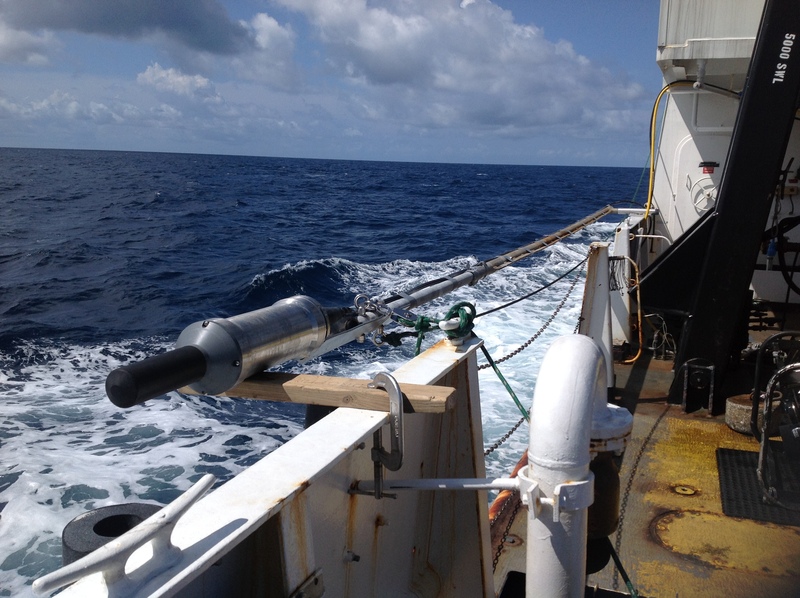 Answer: Aboard the Nancy Foster, we have a Teledyne ADCP – Acoustic Doppler Current Profiler. 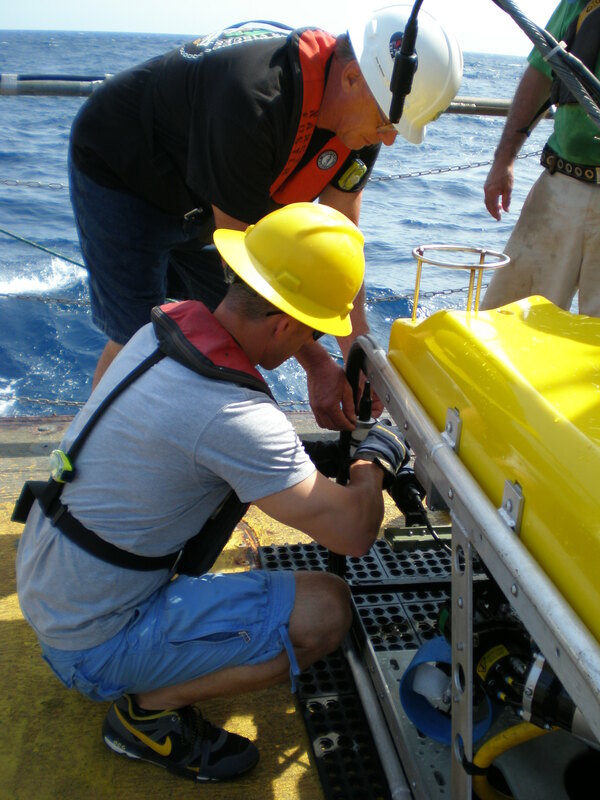 The ADCP measures direction, speed, and depths of the currents between the ship and the ocean floor. It’s not just one measurement of each; currents may be moving in different directions, at different depths, at different speeds. This can make a ROV dive challenging. 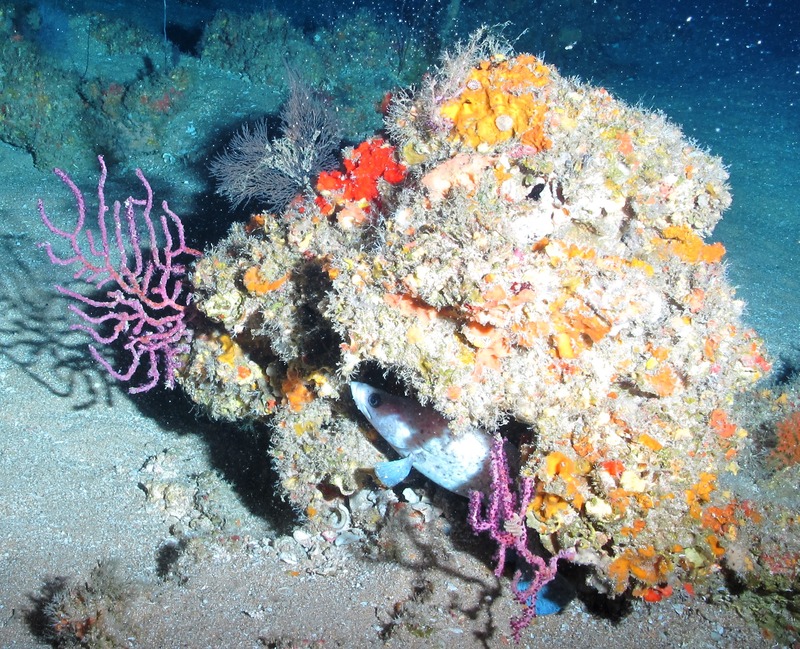 For example, at 4pm on Sunday near the Snowy Grouper MPA site off the coast of North Carolina, from 0-70 meters in depth the current was coming from the north and at about 2 knots. At 70 meters to the sea floor bottom it was coming from the south at over 2 knots. Almost completely opposite. Another indication of the strong currents today was the force against the hydrophone. Hydrophones detect acoustic signals in the ocean. 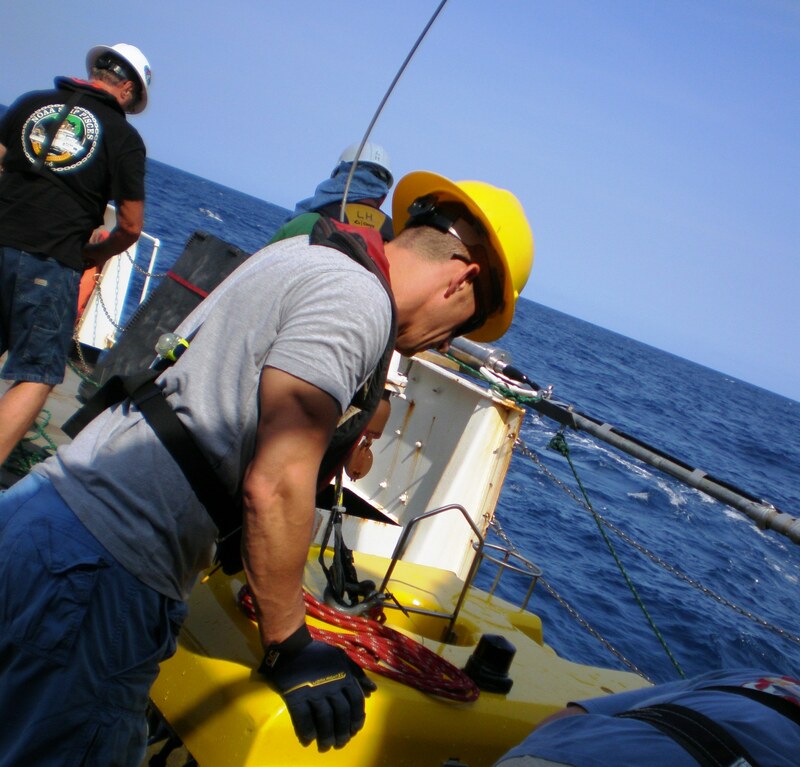 We are using a hydrophone mounted on the side of the Nancy Foster to communicate the location of the ROV to the ship. 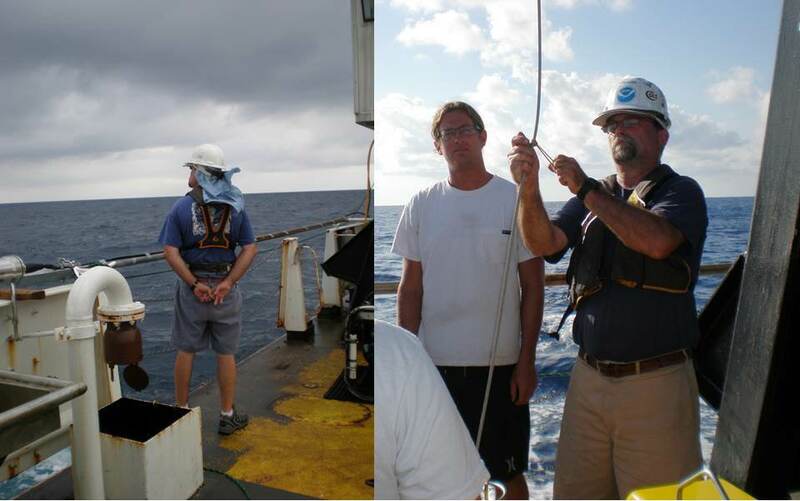 The hydrophone has to be lowered and secured to the ship before each dive. It ended up in my blog today because the current was so strong, three of us could not swing and pull the hydrophone to a vertical position in the water column. It was a good indicator the currents were much stronger than the past few days. 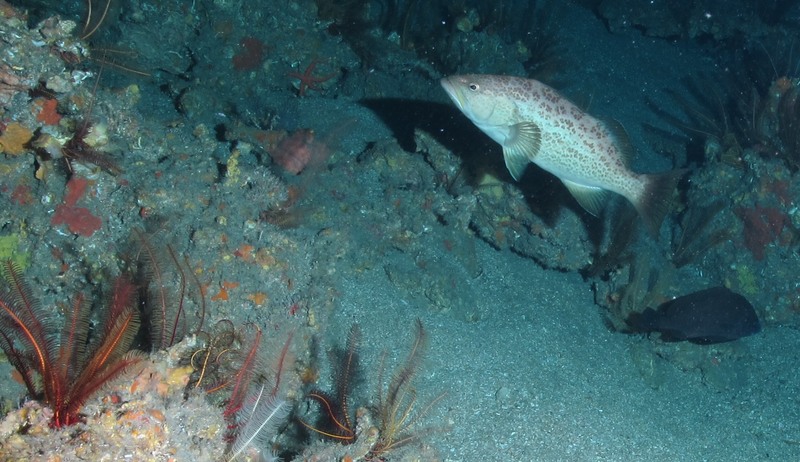 Snowy Grouper are one of the species requiring management due to low and threatened stock levels within the federal 200-mile limit of the Atlantic off the coasts of North Carolina, South Carolina, Georgia and east Florida to Key West. 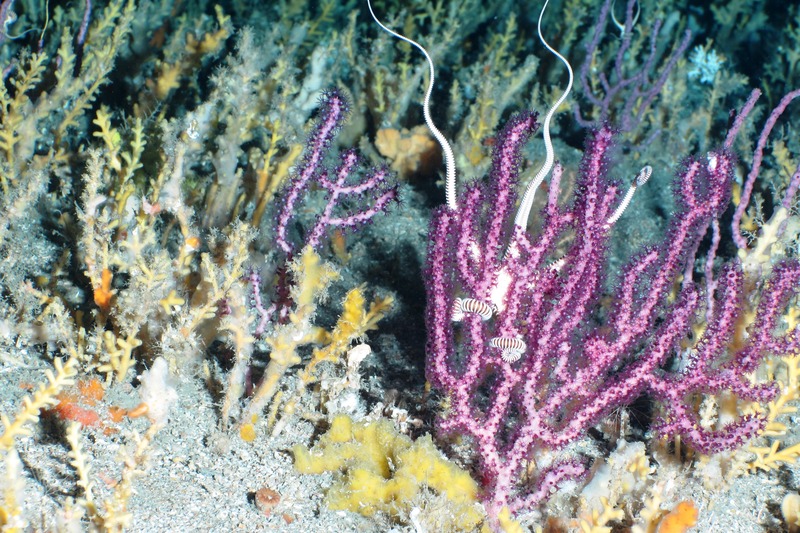 The MPAs help conserve and manage these species. We were excited to have a few visit the camera lens the past two days. 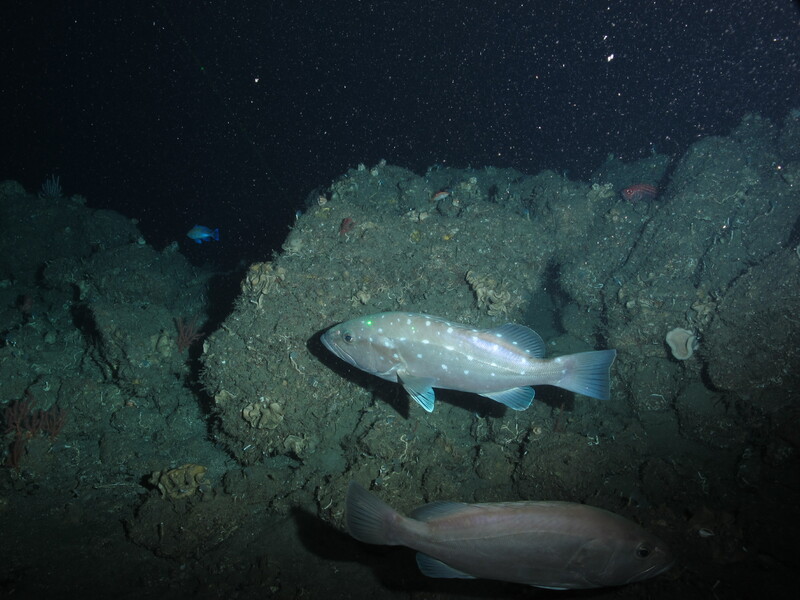 Pair of Snowy Groupers photographed during one of our dives on Friday, June 20. 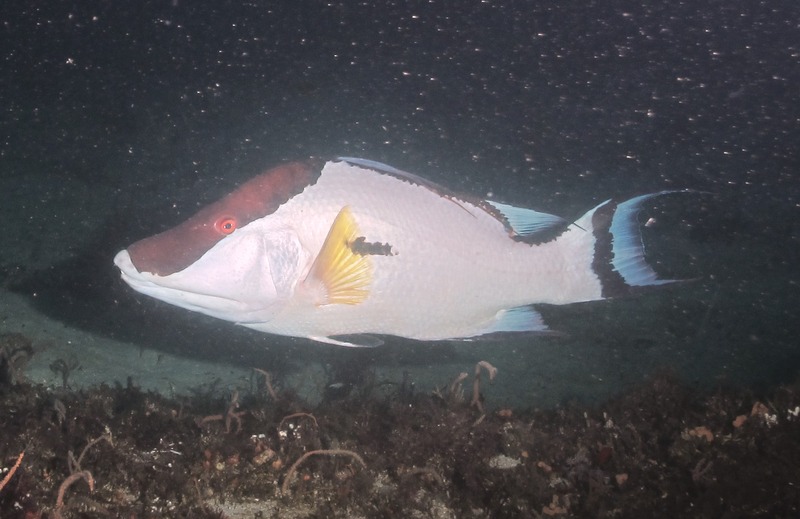 Sizes are approximately 30-50cm (12-20″).Photo credit: NOAA/UNCW. Mohawk ROV June 2014. 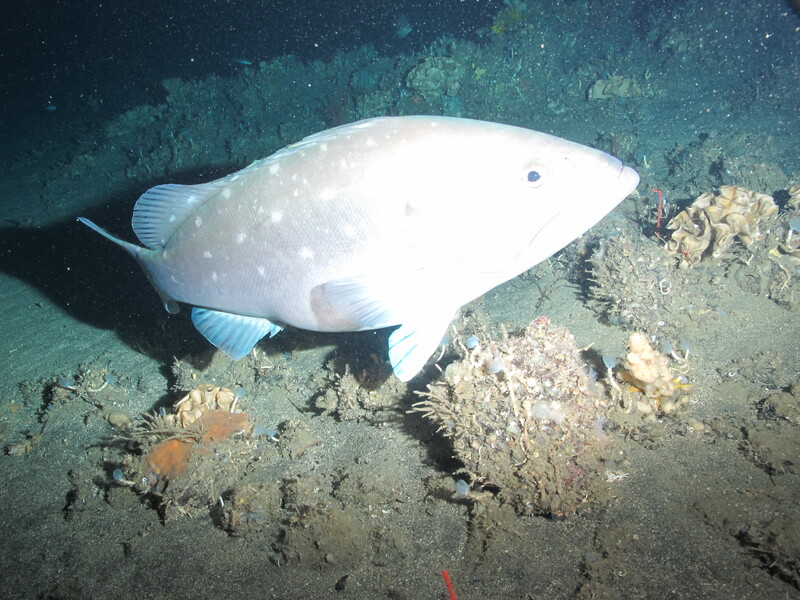 Snowy Grouper photographed during one of our dives on Friday, June 20. Size is approximately 40-50cm (16-20″). 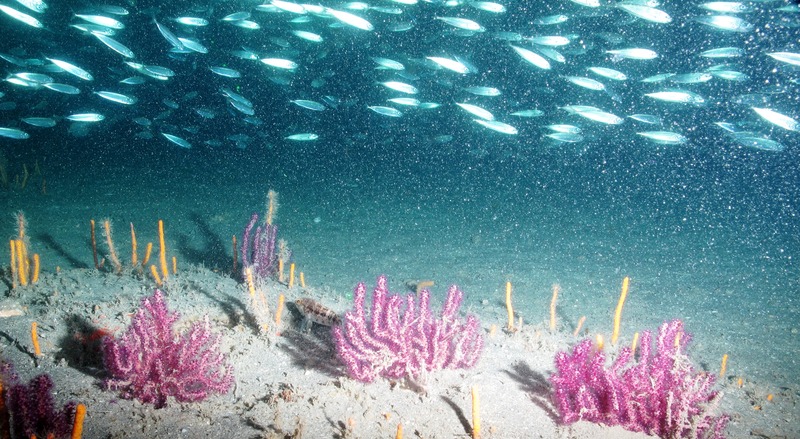 Photo credit: NOAA/UNCW. Mohawk ROV June 2014. Snowy Grouper and a Roughtongue Bass photographed during one of our dives on Friday, June 20. Photo credit: NOAA/UNCW. Mohawk ROV June 2014. 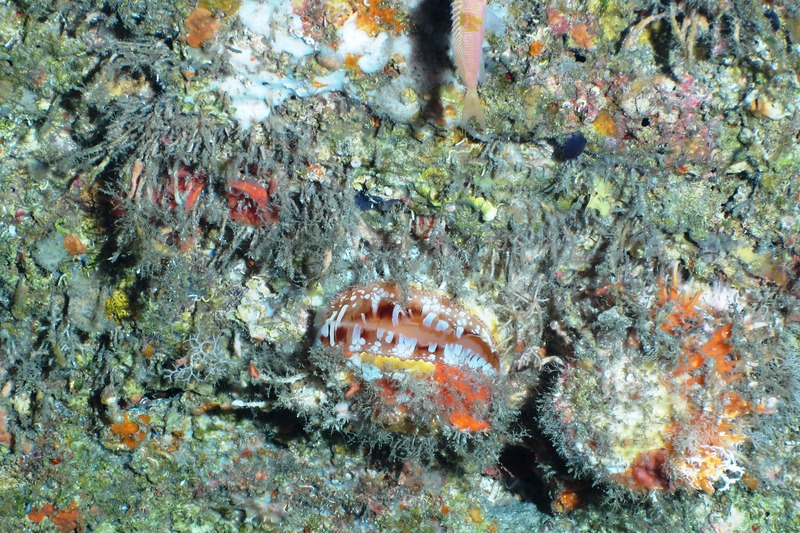 Scorpionfish (Scorpaenidea) photographed during one of dives on Saturday, June 21. Photo credit: NOAA/UNCW. 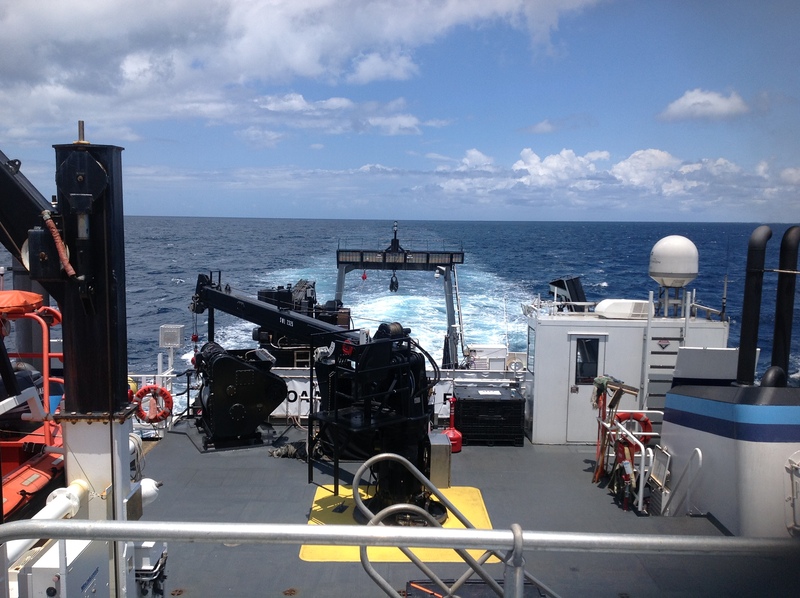 Mohawk ROV June 2014. 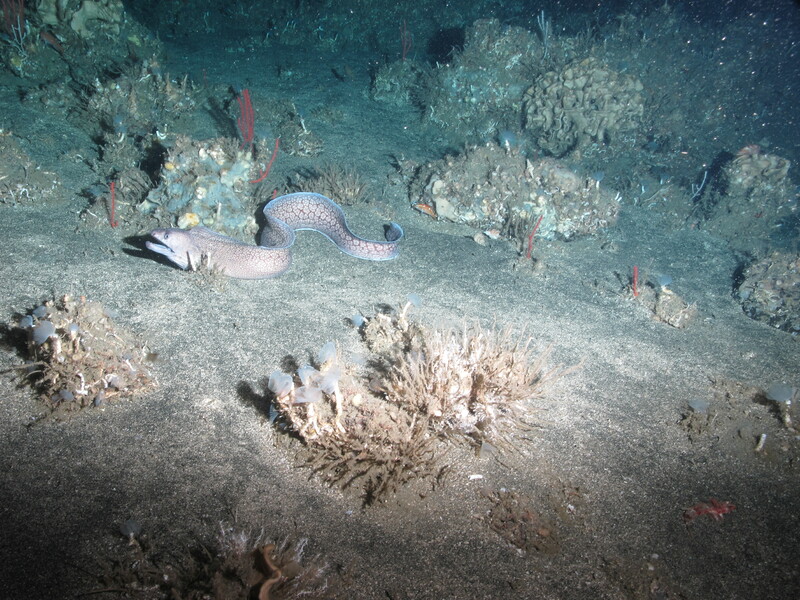 Eel photographed during one of our dives on Saturday, June 21. Saw many of these peeking out of their homes in crevices. We were lucky to capture this one in its entirety. Photo credit: NOAA/UNCW. Mohawk ROV June 2014. Stichopathes, Diodogordia, & Ircinia Campana. Photo credit: NOAA/UNCW. Mohawk ROV June 2014. 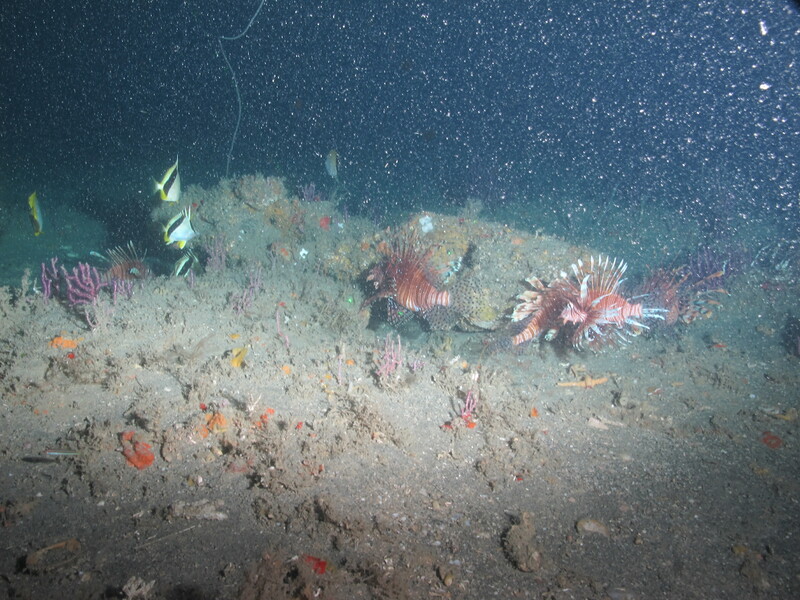 Leiodermatium, Nicella, feather duster crinoids, and a Red Porgy in the far background. Photo credit: NOAA/UNCW. Mohawk ROV June 2014. Rugosity is sea- bottom roughness. Probably one of the terms and skills I will remember most about this experience. In oceanography, rugosity is determined in addition to the other characteristics I am more accustomed to: slope, composition, and the cover type (plants, animals, invertebrates.) It was a little challenging for me to incorporate this into my observations the first few days so thought I would share two of the stark differences. This compliments my strong knowledge and passion for teaching earth science with Earth Adventure; I cannot wait to use this content in future Earth Balloon & Earth Walk Programs! Rugosity Comparison. Low rugosity on the left; high rugosity on the right. The low has a flat plain where as the high has rocks, deep crevasses, slopes, and texture. Snowy Grouper desire high rugosity. Photo credit: NOAA/UNCW. Mohawk ROV June 2014. When a ship has restricted ability to move, the ship displays vertically (up to down) from the mast a black ball, diamond, and black ball. This informs other ships and vessels in the area not to approach the Nancy Foster as we can’t move; the ROV is in the water. While radio communication is an option, this is a marine standard that signals others to stay away. 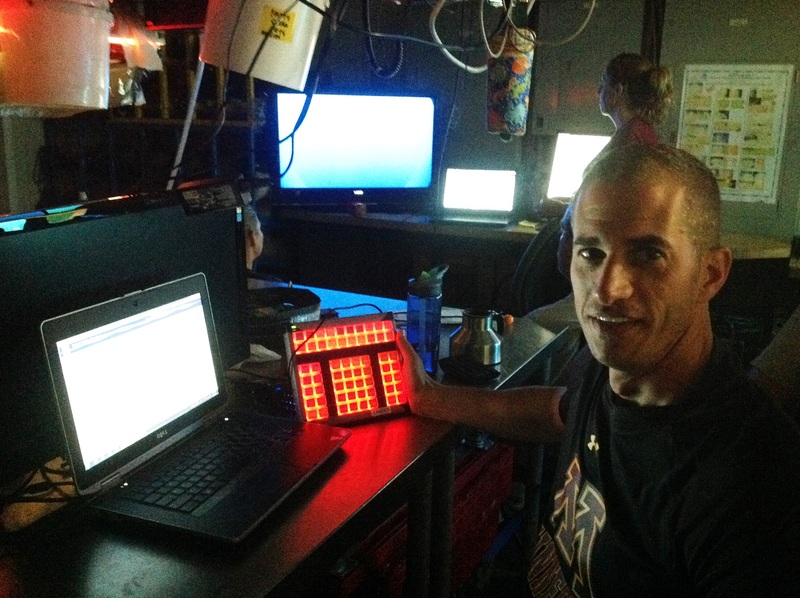 If we were deploying the ROV at night, a series of lights communicate the same message. On Sunday morning, we observed three recreational fishing boats probably a 1.5 kilometers from the ship. It seemed one was moving towards us likely interested in what was happening aboard the giant Nancy Foster. 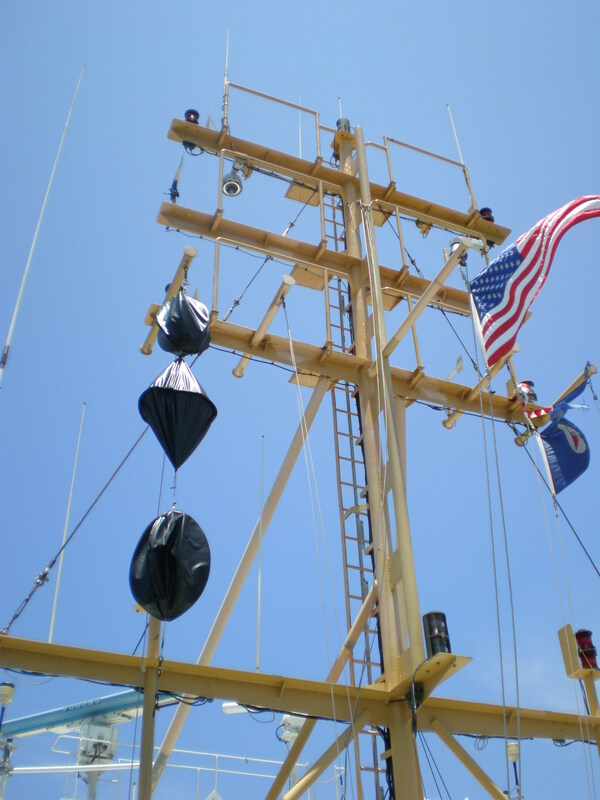 Day shapes displayed on the Nancy Foster ship mast; black ball, diamond, and black ball. 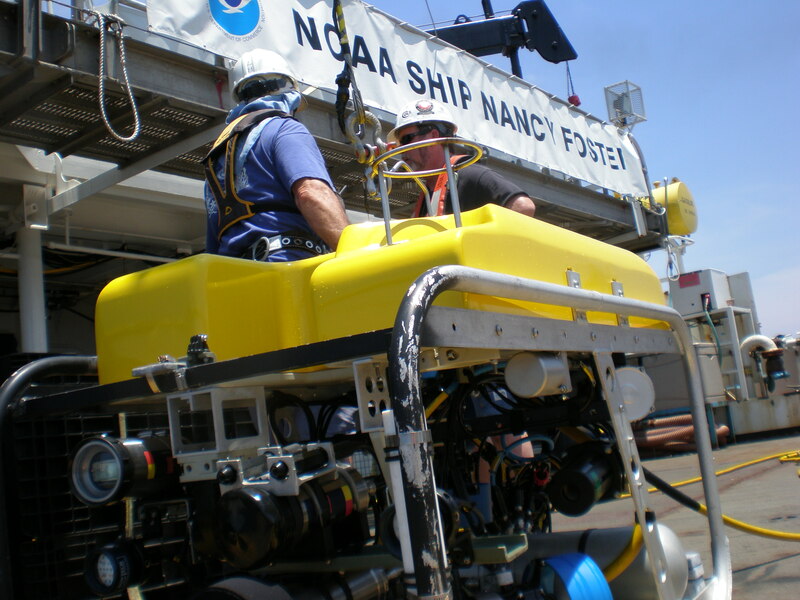 The NF has restricted ability to move; the ROV is in the water. 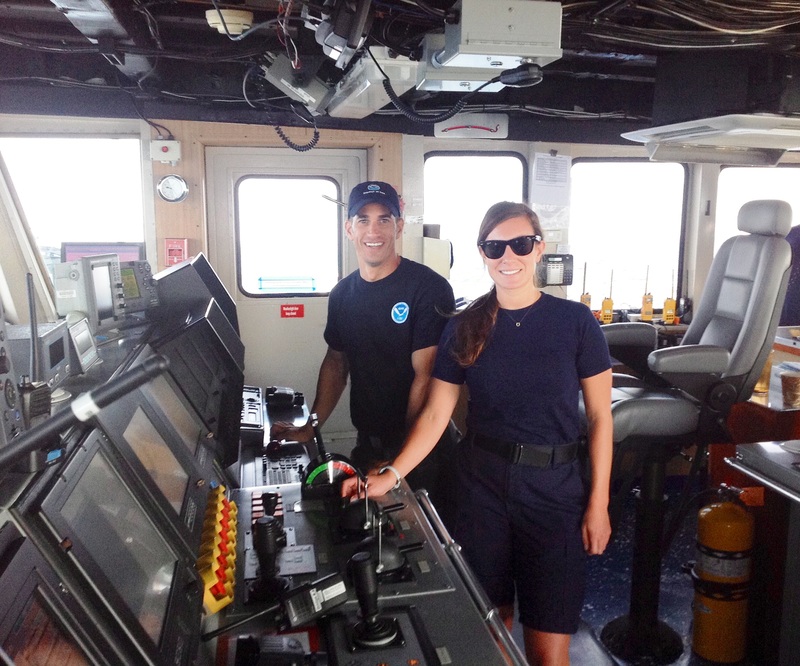 Lance Horn and Jason White are the two ROV pilots on board from the University of North Carolina Wilmington. 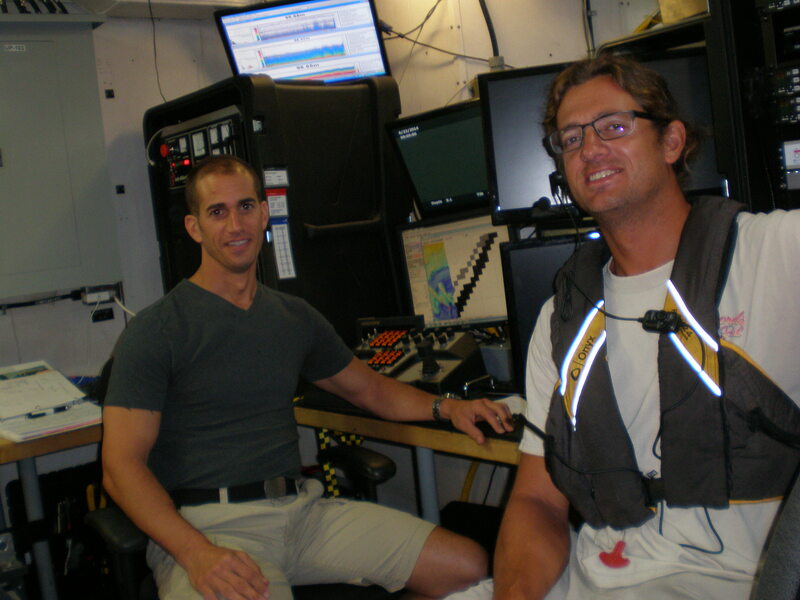 ROV pilots Lance Horn and Jason White. 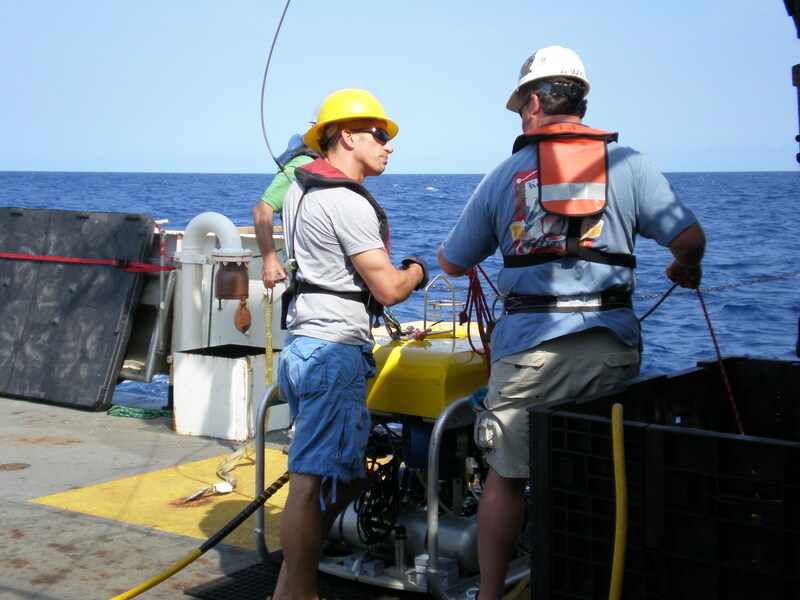 On the left, Lance surveys the ocean ‘shall we launch the ROV or not?’ – or perhaps he is just thinking deep thoughts. On right, Lance and Jason preparing the cable prior to dive. John & Jason White at the ROV pilot control center. A week without television. While I brought movies on my iPad and there is a lounge equipped with more than nine leather recliners, a widescreen, and amazing surround sound, I haven’t yet sat down long enough to watch anything. I spend 12 hours a day being a shadow to the researches trying to absorb as much as I can and lending a hand in anything that can help the mission. Most of my evenings have been consumed by researching species we saw during the dives using taxonomy keys and well, just asking a lot of questions. 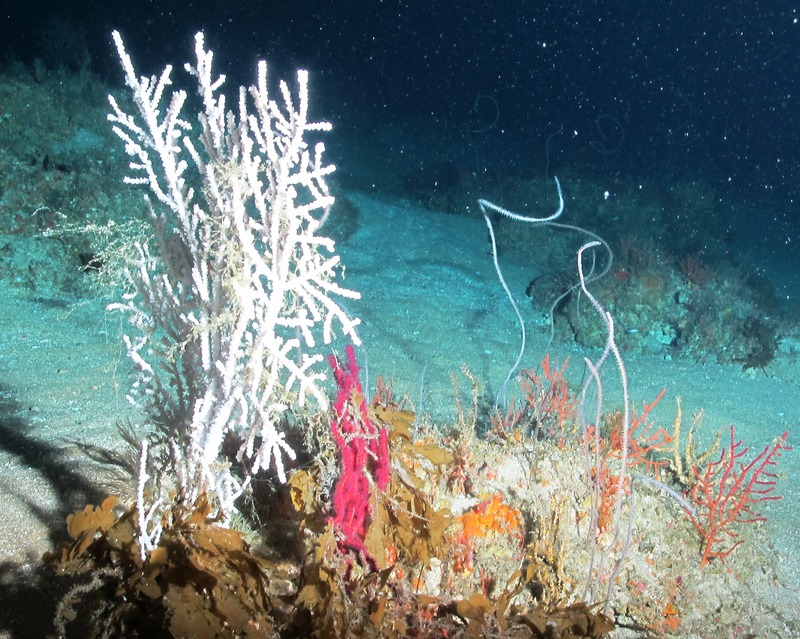 I go through hundreds of digital pictures from the ROV and try to make sense of the many pages of notes I make as the researchers discuss species, habitats, and characteristics during the dives. While I am using a trust book version as well as the multiple poster versions scattered on the walls in the lab, here is a great online key. Sunday evening, crew members of the Nancy Foster invited me to join them in a game of Mexican Train – a game using Dominos. Thanks Tim for including me! I am going to have to purchase this for cabin weekends up north in Minnesota (when the mosquitoes get so large they will carry you away and we can no longer go out in the evenings). 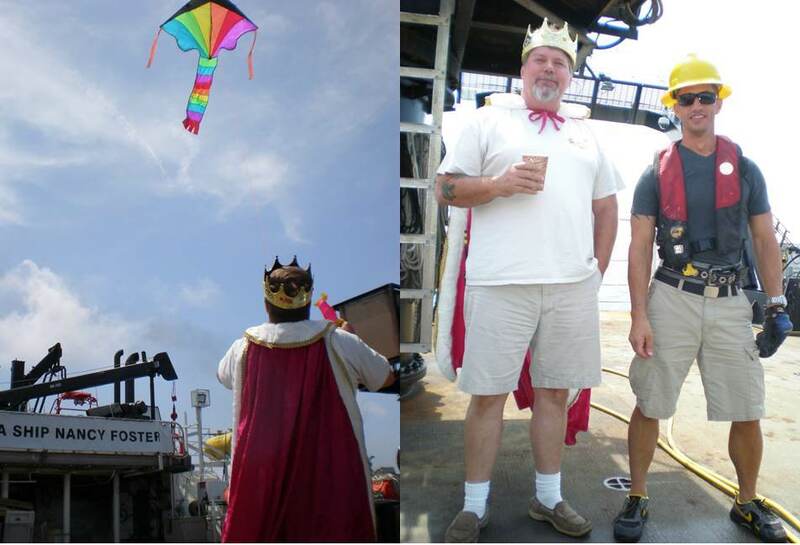 When the Acoustic Doppler Current Profiler wasn’t working, we just called on King Neptune and his kite to help us gauge the wind speed, direction and the currents. Wait, I thought he carried a scepter? Tim Olsen, Chief Engineer – 11 years on the Nancy Foster and 30 years as Chief Engineer. Espresso! I really was worried about the coffee when coming aboard the Nancy Foster for 12+ days. What would I do without my Caribou Coffee or Starbucks? Chief Steward Lito and Second Cook Bob to the rescue with an espresso machine in the mess. John has been very happy – and very awake. I made it a little more progress reading The Big Thirst by Charles Fishman. Each of my logs is going to have a list of new vocabulary to enhance your knowledge. I am not going to post the definitions; that might be a future student assignment. Hello from the Land of 10,000 Lakes and more than 69,200 miles of streams and rivers that all eventually lead to Earth’s oceans where I am headed next as we prepare to depart from Mayport, Florida aboard the NOAA Ship Nancy Foster. My name is John Bilotta (“JB” as many people call me) and I am an educator in water resources and earth sciences for a variety of K12 student, classroom, and adult-citizen leader programs. I have been teaching now for over 20 years. I am honored to be a part of NOAA’s TAS program for 2014. I am very excited to join a group of oceanic researchers and experts for an extended period of time and make a stronger connection to the multiple concepts I teach about Earth’s oceans and landforms. One of my teaching philosophies is to see, touch, smell and be out on the water for effective, interdisplinary education. I spend so much time talking and teaching about the oceans that I am just excited to apply that philosophy to my own learning. 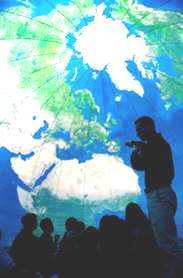 John teaching inside the Earth Balloon. in earth science, geography, water, and environmental sciences. The Earth Balloon brings the entire Earth into a classroom and is an exciting and effective platform (that thrills students and adults alike) to learn about the Earth, its oceans, continents and the forces at work. I am also an Extension Educator with the University of Minnesota’s Sea Grant and Land Grant Extension programs where I concentrate on developing and teaching watershed management programs with a strong focus on stormwater and general pollution prevention strategies. 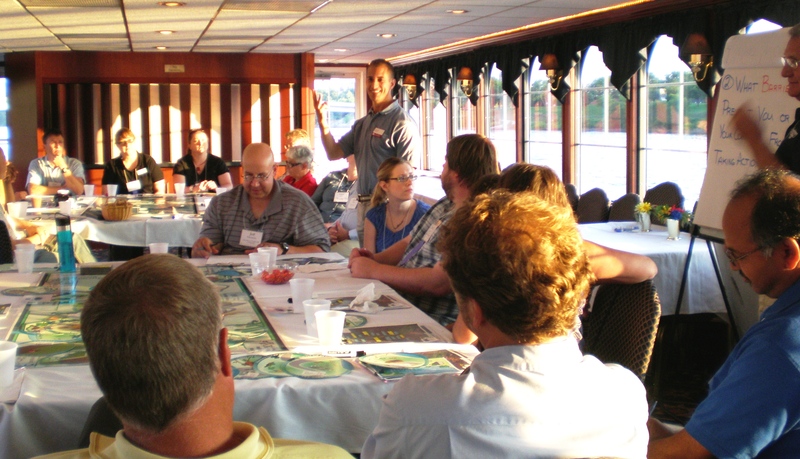 John teaching the Watershed Game as part of a NEMO workshop-on-the-water delivered though Minnesota Sea Grant and Extension. It’s up on the land where we as humans often have the greatest impact that ultimately impact oceans, lakes, and rivers. The aspiration of my teaching is that we can minimize those impacts through increased knowledge and awareness. 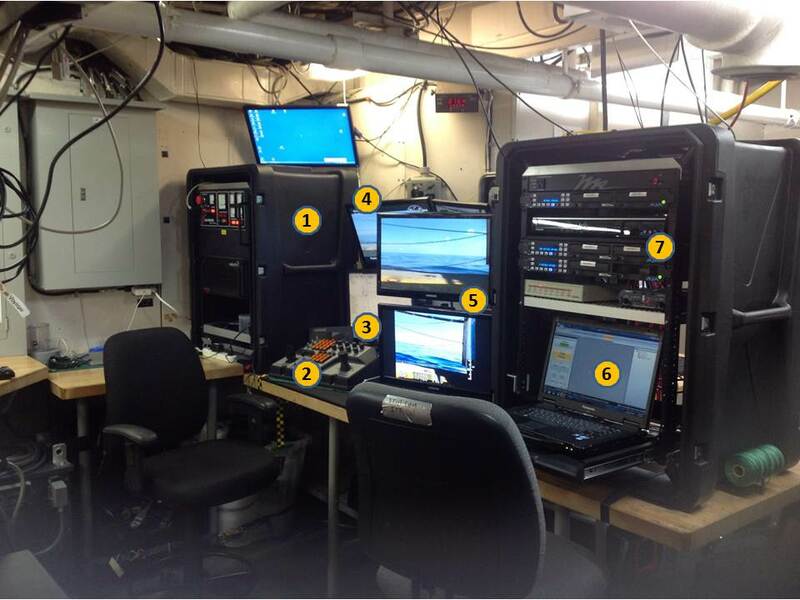 The SubAtlantic Mohawk 18 from the University of North Carolina that we will be using. 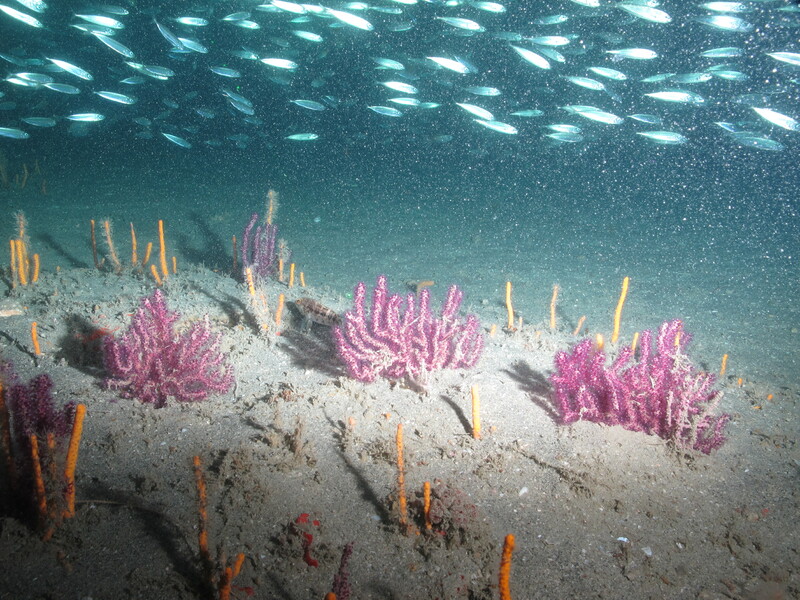 I am joining a team of scientists and crew that will conduct ROV (Remotely Operated Vehicle) and multibeam sonar surveys inside and outside five marine protected areas (MPAs) in the south Atlantic to assess the usefulness of this management tool to protect and help manage fisheries on the continental shelf edge. 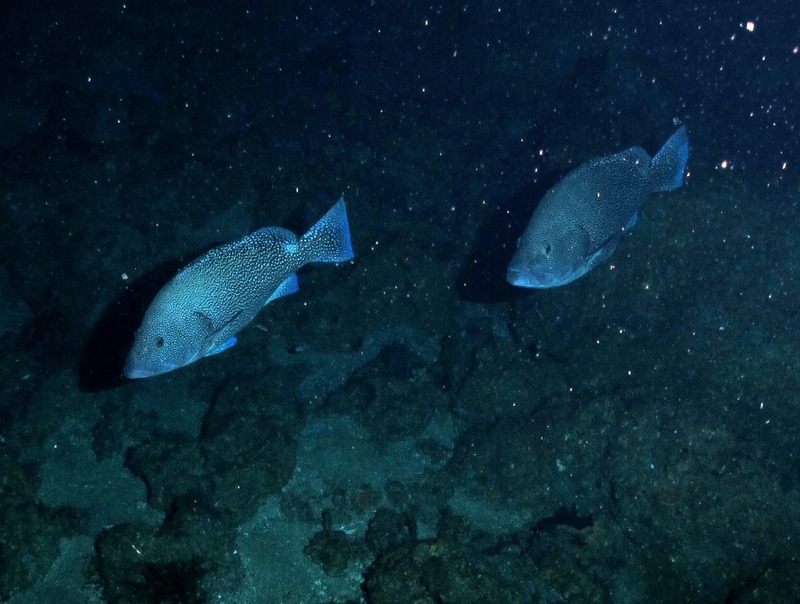 The work will include conducting ROV transect surveys of habitat and fish assemblages, conducting total water column profiles, and conducting multibeam sonar mapping. I am excited to make connections to how we use bathymetry here in Minnesota to assess lakes, how they function, and our impacts to them. A Great Sea in Minnesota – Lake Superior is the largest freshwater lake in the world by surface area and the third largest by volume. Lake Superior is one of Minnesota’s conduits to the open ocean. 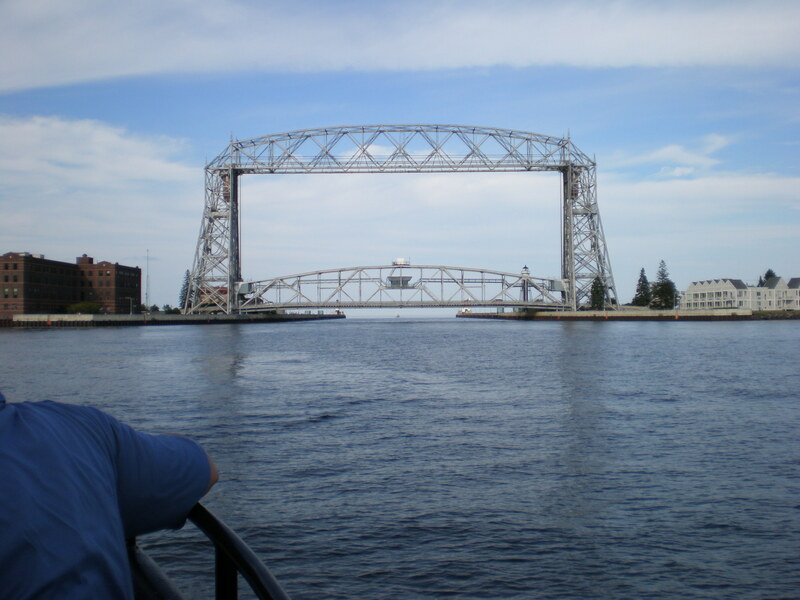 Duluth’s Aerial Lift Bridge and Canal. From here its just a short travel through five Great Lakes and the St. Lawrence Seaway into the Atlantic Ocean. I took this picture as I returned from a excursion out on Lake Superior. The Mighty Mississippi –it begins here! 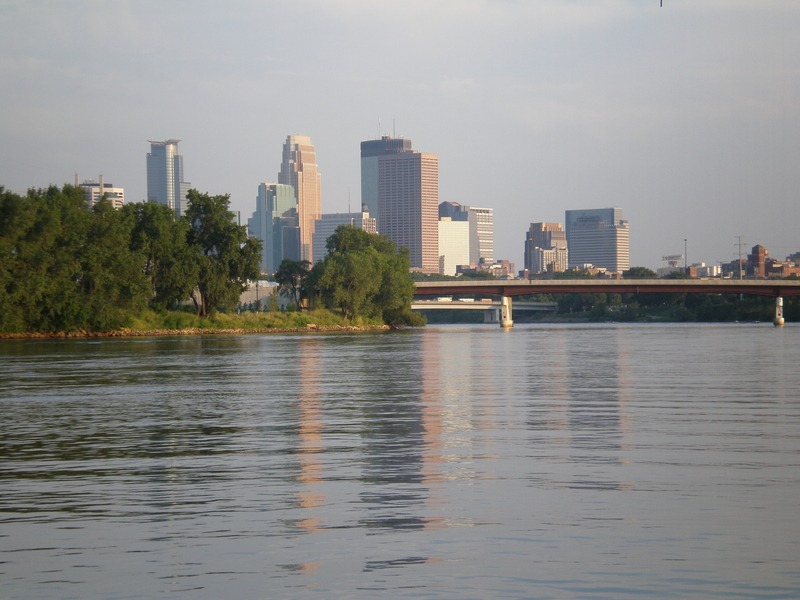 Minnesota is the headwaters of the mighty Mississippi River and is our conduit to the Gulf of Mexico. Oh and by the way, I live not far off this majestic river in Minneapolis and I have to say, there is hardly a day that passes that I don’t get to see it and appreciate it. The Mississippi River in downtown Minneapolis; I have almost a daily encounter with this majestic river. And so my adventure and learning begins! I am nearly packed and ready to go, I am just trying to figure out how to get Lucille, my bulldog, into my duffle bag and past the ship’s XO (Executive Officer) as I board the ship. I will miss her much while out at sea. 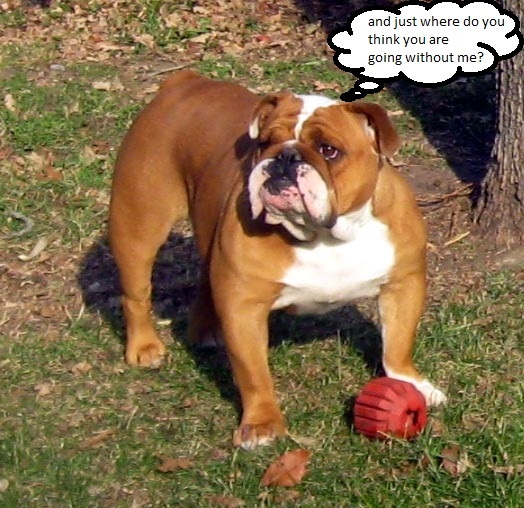 Lucille, the simply just too amazing bulldog.